This hike begins off Forest Road #54. The trail head is very marked. This is an exceptionally outstanding hike. It is a bit steep, but short enough to not matter. The trail begins by gently climbing across an open area before entering the forest. Because this area outside of the wilderness has been heavily logged you will have several open areas with excellent views. The trail gains about 700' before reaching the ridge above Soda Peaks Lake. You can see the lake below you as you look out at the eastern Soda Peak. Now the trail descends rather rapidly to the lake via a long circular switchback. When you get to the lake, it is well worth it to walk over to the eastern side and climb a bit up the rocky side of the east Soda Peak. The views from there add to your reward for coming to this beautiful little lake. Continue north on the Wind River Highway (FR30) for about 8.6 miles to the little community of Stabler and the junction with Forest Road 43, also called Hemlock Road. Turn left onto FR43 and cross a bridge over the Wind River and continue west for a short ways and you will come to the junction of Forest Road 54 which is also called the Szydlo Road. Turn right and follow this road another 3.9	miles to a junction with Forest Road 5401 which is also called Little Soda Springs Road. Bear left and continue steeply up FR54. In another 2.7 miles you will come to the junction of Forest Road 42, but bear to the right and continue climbing on FR54. 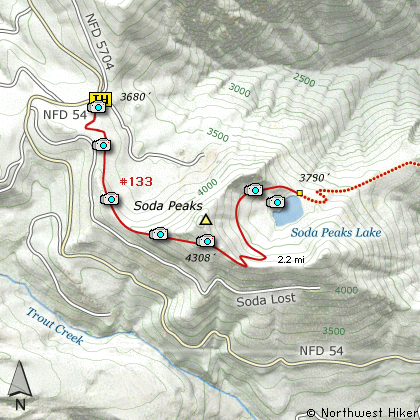 FR54 will continue climbing and circling Soda Peaks to the west for another 6.8 miles. You will then come to a spur road off to your right that is very clearly the parking area for this hike. The trailhead is labeled and you can register for wilderness travel there.